Daffodil. Courtesy of VINE Sanctuary. In nature, hens spend much of their time and energy preparing for reproduction. As with most other animals, their lives revolve around their offspring. The formation and development of an egg requires a significant amount of stored nutrients. Consequently, a hen must eat a large variety of plants and insects to ensure proper growth of the eggshell and its nutrient-rich components. Once a hen has found an ideal location for her nest, she digs a shallow depression in the soil and begins collecting a mixture of grasses, twigs and feathers. She meticulously arranges the materials to form a secure refuge for her eggs. When she is ready to lay her eggs, the hen becomes noticeably anxious. She retreats to the safety and solace of her nest, and one by one, the eggs appear over a period of several days. Classified as “indeterminate layers,” chickens will continue to lay eggs until their nest is full-usually resulting in twelve to fourteen eggs. The laying stage is followed by the incubation period. Over the next few weeks, the hen must keep her eggs at a consistent temperature and humidity to ensure proper development. During this period, she rarely leaves the nest. Nourished by the surrounding yolk, the embryos steadily develop. Periodically, the hen uses her beak to gently turn the eggs and when the chicks are ready to emerge, she can hear their faint chirps through the shell. To break through, the chicks use a special spur on the top of their newly formed beak. The protrusion is known as an egg tooth and is present throughout the bird and reptile classes. When all of the chicks have emerged, the hen leads them to their first drink of water. At this vulnerable stage she teaches them how to forage for food, while aggressively defending them from predators. Over the next several weeks, she nurtures and protects her chicks-selflessly attending to their every need. The reproductive cycle is then repeated two to three times a year. 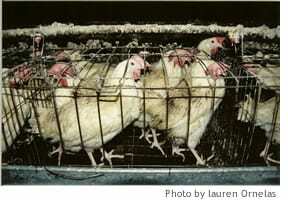 In industrial animal factories, hens live in arguably the worst conditions of any farmed animal. Living in extreme confinement and unable to perform any form of natural behavior, they suffer day after day in conditions that no living creature should ever have to endure. The industry’s business model is based on a high volume of production, with a relentless motive to minimize expenses and maximize profits. At the age of 18 weeks, the hens are placed in what is known as a “battery cage.” Each cage holds 5-10 hens, giving each bird approximately 67 square inches of space-the size of an average mouse pad. Approximately 95% of hens in the U.S. egg industry live in this extreme confinement until they are slaughtered at the age of 18-24 months. Unable to dust bathe, perch, or even spread their wings, the hens are in a constant state of physical and psychological stress. In these extremely unnatural conditions, hens could potentially pluck their own feathers and aggressively peck their cage mates. Rather than give them sufficient space, a significant portion of each bird’s beak is cut off using a hot blade shortly after they are born. This mutilation is performed without the use of anesthetics. 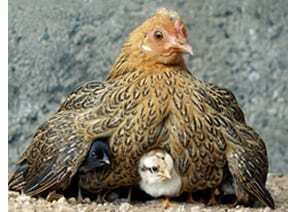 When a hen is ready to lay an egg, she struggles to reach a corner of the cage. Her instincts tell her to find a safe place, but she has no refuge. She must lay her egg inches away from her cage mates. Rather than the 10 to 15 eggs laid naturally in a year by red jungle fowl, the presumed ancestor of today’s domestic chicken, industrial farmed hens have been manipulated to lay more than 300 eggs per year. [4,5] The calcium devoted to this volume of egg laying leaves their bones extremely brittle and prone to breaking. In addition, the hens’ legs, wings, and heads commonly become entangled in the wire cages, causing them to be trampled by their cage mates. At any given time, thousands of hens are simultaneously chirping in distress. After 18-24 months, their laying rate begins to decline, at which point the industry considers them “spent” and sends them to slaughter. Transporting hens to the slaughterhouse is an extremely traumatic event. Before they can be loaded into the trucks, they must be physically collected. 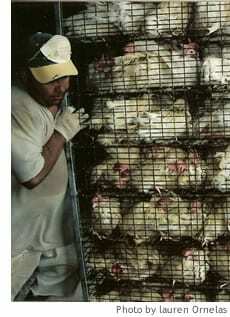 Workers disperse throughout the shed and forcefully pull the exhausted hens from their cages. In the process, many of the hens suffer broken wings and legs. They are then loaded into transport crates and stacked onto large flatbed trucks. During transport, the unfamiliar sights, smells, sounds and movements cause severe stress. Current laws allow transporters to travel up to 28 consecutive hours without a rest period. The 28-hour period can be extended to 36 hours by simply submitting a written request. During this time, the hens are deprived of food and water. Many do not survive the trip. When the hens arrive at the slaughterhouse, the crates are unloaded and stacked onto conveyer belts. One by one, the hens are removed from the crates and shackled by their feet. Hanging upside down, they struggle to free themselves as they are passed through an electric water bath designed to stun them before they are killed. In many industrialized animal factories, the killing lines move so quickly that many of the hens are not properly stunned. The next station consists of automated blades that cut the hens’ throats as they pass by, causing them to slowly bleed to death. Once again, because the killing lines move so quickly, many of the hens do not bleed to death before reaching the next station. Their fate is the worst of all, as the next station is a scalding tank designed to remove their feathers. Poultry scientists acknowledge that when the hens do not bleed to death, they can regain consciousness before entering the scalding tank, in which case they are boiled alive. Once the feathers have been removed, a series of eviscerating machines remove the head, feet and internal organs. While some of the hens are killed in the same slaughterhouses as chickens raised for meat, the industry is no longer finding this profitable. Rather than transporting and slaughtering these hens for one pound of “meat,” the industry is shifting to on-site “disposal.” Current methods of “disposal” include killing hens with CO2 and composting their bodies, breaking their necks (known as cervical dislocation) or grinding them alive (known as maceration). [8,9] In some cases, hens in the compost piles are still alive, and struggle to free themselves. Some industrial animal factories force the hens to endure one last round of heavy egg laying before they are discarded. In a process known as “forced molting,” all food is withdrawn for approximately 14 days. The resulting stress causes the birds to lose nearly all their feathers, which stimulates a brief, prolific egg laying period. The newest form of forced molting utilizes nutrient-deficient filler foods rather than starvation. While the females suffer for many months in these factories, the male chicks have a more brief but equally disturbing fate. Unable to lay eggs, and the wrong breed for the meat industry, the one-day-old male chicks are killed immediately at the hatchery. Every year in the United States, 200 million male chicks are either ground up alive and made into fertilizer, or dumped into large garbage bins and left to suffocate. These tragic conditions are real, and they occur every day in industrial animal factories across the country. The industry’s standard practices show no regard for the animals’ mental or physical health. Like all other industrially farmed birds, hens are not protected by the Animal Welfare Act or the federal Humane Slaughter Act. Hens in industrial animal factories live a polar opposite existence to their wild counterparts. These hens never scratch in the dirt, feel a blade of grass, build a nest, or even stretch their wings. The egg industry shows no signs of voluntarily improving their inherently inhumane standard practices. It is up to consumers to reject this unnecessary suffering, and promote a more sensible and sustainable future by adopting a vegan lifestyle. United Egg Producers. (2008) Animal Husbandry Guidelines for U.S. Egg Laying Flocks. 2008 Edition. Webster, A.B. and Fletcher, D.L. 1996. Humane on-farm killing of spent hens. J. Appl. Poult. Res. 5:191-200. Newberry, R.C., Webster, A.B., Lewis, N.J., and Arnam, C.V. 1996. Management of spent hens. Proc. Symp. Farm Animal Welfare in Canada. Lennoxville, Quebec, Canada.